Bees are four-winged, flower-feeding insects. They have enlarged hind feet, branched or feathered body hairs, and generally a stinger. Bees are beneficial insects because they produce honey and pollinate crops. Honeybees (or hive bees) are in the animalia kingdom, the arthropoda phylum, the insecta class, the hymenoptera order and the apoidea family. Honeybees are social bees and live in colonies. Solitary bees make their own small family nests. There are 10,0000 - 20,000 species of bee including many wasplike and flylike bees. 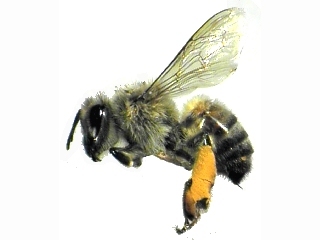 Most bees are small from 2 mm (.08 inches) long to 4 cm (1.6 inches) long. Bees and wasps are closely related. The main difference is that bees provide their young with pollen and honey, while wasps eat animal food, insects, or spiders. In addition, wasps have unbranched hairs. Honeybees live in hives or colonies. A small hive contains about 20,000 bees, while some larger hives may have over 100,000 bees. Hives include one queen, hundreds of drones, and thousands of worker bees. The worker bees are female, but they do not breed. The queen bee is female and creates all the babies for the hive. The drone bees are male and do not have stingers. Bees communicate with each other about food sources using dances. The sounds from the movement of the bees is picked up by the tiny hairs on the bee's head. Bees use the sun in navigation. The honeybee's hive has cells made of wax. This is where the queen bee lays her eggs. She can lay 1500 eggs in one day. When the larvae hatch, they are fed by the worker bees. The workers collect pollen and nectar from flowers. 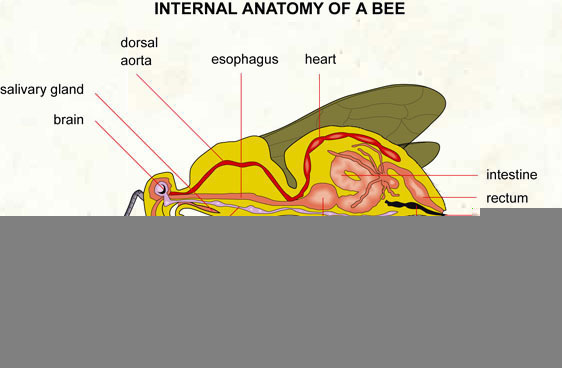 The pollen is used as a protein source and the nectar is an energy source. Some of the pollen lands on the pistils of the flower and results in cross-pollination. This is important for some crops and flowers. The relationship between the plant and the insect is called symbiosis. Bees turn the nectar into honey. Workers must visit over four thousand flowers to make just a tablespoon of honey. Beekeepers must be very careful when they remove honey from the hive. They try not to hurt the bees. The beekeepers give sugar syrup to the bees to replace the honey that they take.